Do you currently accept card payments? When it comes to prices, merchant account providers are about as transparent as an Oak tree. But don’t worry, Expert Market is here to make things crystal clear for you. Read our guide for an up to date breakdown of merchant account fees, or click on one of the icons below to sign up to our merchant account comparison service to receive bespoke quotes from up to four leading suppliers. Transaction fees are made up of a percentage charge and a fixed “authorisation fee”. As a general rule, the more you take in card payments, the less you pay in transaction fees. Okay we know, unless you’re a maths genius these figures on their own aren’t much help. So let’s crunch the numbers and do a real-world comparison. Imagine for a moment that your business processes 1,000 card transactions each month. These transactions have an average value of £5. Of the 1,000, 800 were made using debit cards and 200 using credit cards. This is the minimum amount in merchant fees you will be required to pay each month. So, if your monthly service charge is £10 and you only rack up £7 in fees, you will still be billed £10 by your provider. 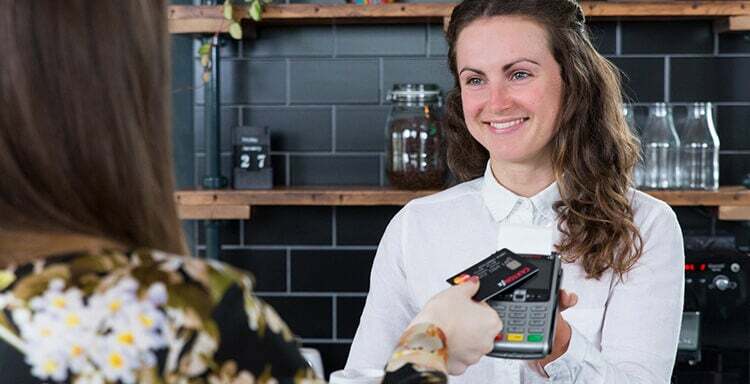 It goes without saying then that if your business processes a low volume of card transactions (less than 500 monthly) you’ll want to choose a merchant account with a low monthly service charge. Set up by the worldwide Payment Card Industry Data Security Standard — or the PCI DSS if you’re on first names terms with them — PCI compliance is a legal requirement for all businesses that accept card payments. It’s a series of checks to ensure you’re not exposing your customers to potential fraud risks. These checks range from a simple questionnaire to full computer network scans, depending on the size and nature of your business. We recommend paying a small monthly fee of around £5 per month to have your merchant account provider do it for you. Set-up fees are rare but some providers do still charge them. Lloyds, for example, charge a whopping £50 activation fee. Unless the rates on offer are out-of-this-world good then it’s worth steering clear of providers that charge for setup — there are plenty out there who don’t. This charge relates to the termination of your merchant account contract, and that alone. Bear in mind that if you want out early and you’ve rented a card machine from your merchant account provider you will be required to pay the remainder of that rental contract. Most merchant service providers offer to include card machine rental with their credit card charges to retailers. Costs vary depending on the type of card reader you want. A payment gateway is a vital piece of (virtual) kit for any business that wants to sell online. Linked to the shopping cart of your website, it’s a clever piece of software that encrypts customer payment details and transmits them to the merchant bank securely. Ecommerce transactions carry a higher fraud risk than in-store card processing, where the transaction takes place face-to-face. And for this reason online transaction charges are slightly higher. If you want to take card payments from customers over the phone then you’ll need a virtual terminal. Accessed via your web browser, a virtual terminal is a secure way of storing and encrypting payment information. The customer calls, you answer the phone. They read you their card details, you enter these details into the virtual terminal. It’s that simple. Chargeback is a source of much grumbling among merchants. It can occur when a customer disputes a transaction because they don’t recognise the charge on their statement ie. because of fraud. Or because they’re dissatisfied with the service or product received and have been unable to resolve the situation with you (the merchant) to their satisfaction. In both scenarios, the full transaction amount will be taken from your bank account pending an investigation. In most cases, the bank will side with the customer and you will be forced to pay a full refund as well as a £15 chargeback fee for being so darn reckless. Interchange is set by the card association — that’s Visa, Mastercard and Discover. Forming a portion of the transaction fees charged by providers, it’s a mandatory charge capped at 0.2% per transaction for debit cards and 0.3% for credit card processing fees. The average merchant account contract length in the UK is 18 months. Don’t tie your business into a rotten deal — do your research and choose your provider wisely. Are you looking for the cheapest merchant services for your business? Of course you are! Why wouldn’t you be? Know your business: If you can’t give accurate figures for turnover and volume of card transactions then you’re not going to get an accurate quote. Make sure give the same figures to all the providers you speak to. Make a checklist: List all the fees we’ve covered in this article and be sure to ask about them. Don’t assume there won’t be required to pay certain fees just because the merchant service provider doesn’t them mention in their initial quote. Contact multiple providers and compare quotes: To compare merchant account fees for your business, simply click on one of the icons below and complete our webform to receive free quotes from up to four leading providers. Don’t be afraid to negotiate: Remember, these guys want your business and merchant accounts is a competitive industry. Don’t be afraid to play one provider off against another. What type of merchant account do you need? Contactless cards and cashless societies - What's in store for cash?